Here is a great video by Eleanor Burns where she shows how to make her crazy quilt and strip stockings. It’s a great way to use up scraps and have fun experimenting with the various stitches on your machine. Here’s a link to the free Quilt in a Day patterns page, you’ll have to scroll to find the Strip Stocking pattern as I wasn’t able to link to it directly. Det er godt nok en smart måde at sy den på, tak for det. 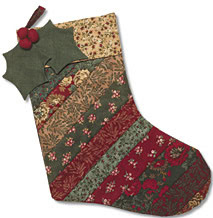 That is such a gorgeous Christmas stocking. I have been looking out for a couple of unusal ones for my kids the past couple of years but have put out of my mind the idea of making them myself, now ive seen this though I really want them.